Senior U.S. officials confirmed early Monday that Iran has successfully test-fired multiple nuclear-capable missiles in violation of United Nations restrictions on such activity, drawing a fierce reaction from the Trump administration, which will pressure European leaders this week to take immediate action aimed at countering Iran's latest military moves. 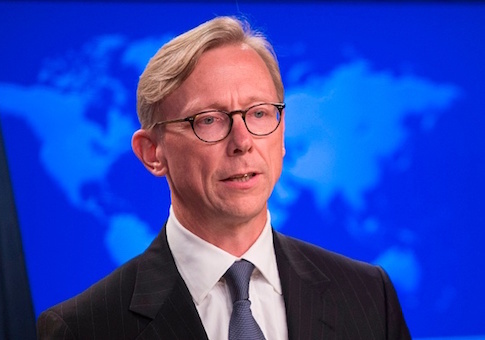 Refuting Iranian claims that its illicit missile tests are defensive in nature, Trump administration Iran envoy Brian Hook vowed tough reprisals for Iran's most recent missile tests, which are among the most provocative in recent memory. "Iran has launched missiles that are capable of carrying multiple warheads, including a nuclear weapon," Hook confirmed to the Washington Free Beacon while talking to reporters aboard Secretary of State Mike Pompeo's airplane en route to Brussels for NATO meetings. The Trump administration's response to these latest tests stands apart from that of its predecessor, the Obama administration, which intentionally left Iran's ballistic missile technology off the table when inking the landmark nuclear pact. "The Iranian government claims that its missile testing is completely defensive in nature. How exactly is the world's leading sponsor of terrorism entitled to the claim of defense?" Hook asked. "In fact, Iran's security concerns are entirely self generated. Was the plot to bomb Paris defensive? Was the assassination attempt in Denmark defensive? Is smuggling missiles to the Houthis in Yemen to attack Saudi Arabia and the Emirates defensive? Is harboring al Qaeda defensive?" "For the last 12 years, the United Nations Security Council has been telling the Iranian regime to stop testing and proliferating ballistic missiles, and Iran continues to defy the U.N. Security Council," Hook said. "Iran's continued testing and proliferation of ballistic missiles shows that the Iran deal has not moderated the Iranian regime as some had hoped." "It was a mistake to exclude missiles from the Iran nuclear deal and is one of the principle reasons the United States left it," Hook said, directly criticizing the previous administration for caving to Iran's demands that its advanced missile program not be covered under the deal. "Iran's defense needs would be entirely different if they had not decided to wage sectarian wars of choice for the last 39 years." Pompeo is expected to raise the issue of Iran's missile activity during meetings Monday and Tuesday with European officials. "We would like to see the European Union move sanctions that target Iran's missile program," Hook told reporters. "Just a few days ago, we unveiled new evidence of Iran's missile proliferation," Hook explained. "Three days later, they test launched another medium range ballistic missile". "We have been warning the world for some time that we are accumulating risk of a regional conflict if we do not deter Iran's missile testing and proliferation," he said. "Iran is on the wrong track and our campaign of maximum economic pressure is designed to starve the regime of the revenue it needs to test missiles and proliferate missiles, support terrorism, conduct cyber attacks, [and] conduct acts of maritime aggression." This entry was posted in National Security and tagged Iran, Mike Pompeo, Trump Administration. Bookmark the permalink.